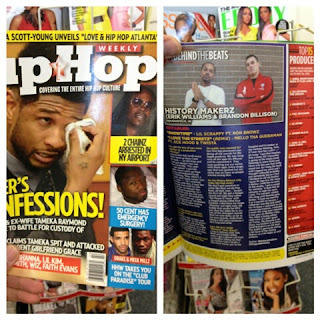 On June 6th, 2012 exactly two weeks ago the History Makerz made history (no pun intended). Erik Williams and Brandon Billeisen were featured in the Hip Hop Weekly Magazine, Behind the Beats section. The two Indianapolis natives are known for their genius music production work and hard work and determination. They are a duo that creates heavy hitting sounds for songs, distinct professional sounds for applications and games and can take a rough version of a song and turn it into a radio ready release. This is a music production team that loves music and it shows in the records that they produce. Two of the songs to come this summer from the History Makerz are "I Luv The Streetz" by Mello Tha Guddamann featuring Ace Hood and "I'm On" by Showtime featuring Ron Browz and Lil Scrappy. Keep an ear out for the History Makerz music, they are playing in a speaker near you!